PUXICO, MO. – The Missouri Department of Conservation (MDC) will soon complete the Golden Anniversary Wetlands Initiative renovations at Duck Creek Conservation Area (CA) as the final phase of the multi-year project begins. These renovations will help area managers control water levels on the area, decrease disturbance of waterfowl on the area, and improve public access. 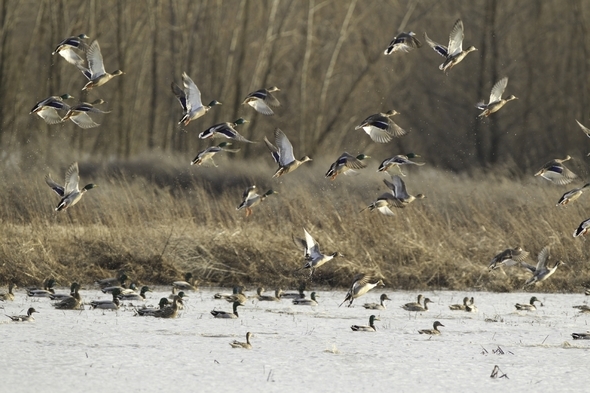 The 6,234-acre Duck Creek CA was purchased in 1950 to provide waterfowl hunting opportunities in southeast Missouri. The original man-made structures (levees, pipes, water control gates, etc.) installed over 60 years ago outlived their life expectancy. The Golden Anniversary Wetland Initiative that began ten years ago has already greatly improved the area with a considerable amount of planning and funding for wetland restorations at Duck Creek and four other of the oldest wetland areas across the state. This final phase of the renovation to Duck Creek CA includes construction of two footbridges, one water control structure with a concrete bridge span, Grim Levee grading, two weir wall water control structures in the Grim Levee, grading of the entrance road to Pool Three, and eight aggregate pullouts along the Pool Three road. The total cost of this project is $690,089.76. Walker said these renovations will also provide better public access to Pool Eight by replacing two wooden footbridges from Duck Creek CA across Ditch One. MDC will add vehicle pull-off areas along the road around Pool Three to allow access by two-way traffic. This will reduce the traffic flow through the core of the area during duck season and provide quicker access from U.S. Highway 51 to Pool Three. Based on the renovation timeline, this work should not impact duck season, she said. However, there may be changes in traffic flow. “We suggest hunters check the MDC webpage or call the Duck Creek CA information hotline for area specific information and renovation updates, so they know what to expect on the area,” Walker said. The Duck Creek CA information hotline is (573) 222-3337. According to MDC Project Engineer Mattheuw Prenger, timing of the renovation completion is dependent on weather. Find more information about Duck Creek CA at https://nature.mdc.mo.gov/discover-nature/places.